After Merce Cunningham company disbanded on New Year's Day, we were all so busy mourning and feeling sorry for ourselves that we didn't necessarily notice his dancers moving on with things. 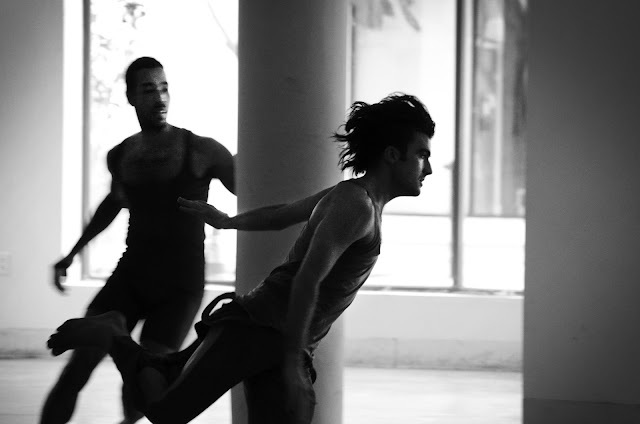 In the wake of Rashaun Mitchell's Nox, a collaboration with fellow alum Silas Riener, at Danspace Project last week, it seems now like a revelation: that dancers with immense skills, at once specific and broadly applicable, are now free to forge new artistic paths. This epiphany was manifested in a meditation about writer Anne Carson's brother dying and being remembered in an accordion book epitaph and translated poem by Catullus; the performance "is a replica of it, as close as we could get," according to Carson. Riener seemed to embody the spirit of the lost soul, appearing in blindingly lit doorways and sprinting across the balcony and stage in abject recklessness. He tried to meld with the church walls, pushing on the immobile plaster pillars like Sisyphus in an absurdly unwinnable battle. His shadow drifted eerily past externally-lit stained glass windows. Riener tumbled down the sanctuary risers, or crawled down them arachnid-style on his elbows and knees. He seemed to be trying to cleave his body from his spirit, and very nearly achieved it, from what I could tell. During these exorcismic attempts, Mitchell largely observed him at a short distance. "I prowl my brother," intoned Carson, precisely. Mitchell began the piece by entering, circling the stage periphery, and sitting on the the floor just in front of us, back to us, his bearing quietly powerful. He perhaps represented the family, or the rest of us—helpless voyeurs; catching Riener's falling body (and vice versa), interacting with him for spans and yet never completely connecting. Riener was fully present and yet in another psychic universe. He has that alchemical balance of being in complete control of his impressively skilled movements, and yet on the very edge of abandon. A memory of him similarly tearing up the stage in Merce's Split Sides last winter at BAM is forever branded in my brain. Davison Scandrett designed the lighting, which with the inside-out staging, pushed into all corners and garretts of the church. Carson and artist Robert Currie scrawled magic marker drawings on two overhead projects, reminiscent of elementary school. They drew images of Mitchell and Riener, pinned to the wall where the projectors shone, in some futile attempt to capture them. Chunks of text were spoken, layered with Benjamin Miller's haunting sound score, mixed live. Carson's visible presence as an "artist" was conceptually at odds with her recorded/live readings. Her role as a big catalyst for literary/choreographic collaboration in recent years should be noted, particularly in light of her program bio, which says this well-known writer "teaches ancient Greek for a living." In the searing, chaotic finale, Mitchell gave Riener "CPR," essentially dribbling his ribcage off the floor repeatedly. Riener folded into himself, grabbing his legs like alien objects. He rolled over the tops of his toes, arching into a backbend supported on the other end by his face, spirit nearly anarchically liberated. Mitchell could only watch, riveted as we were, and comfort him in his torturous transition. So true--amazing piece (though I wasn't so crazy about the text), incredible dancers. Riener is on another plane.